Ocean view and Condo Less than 5 min walk to the beach and open fresh air! 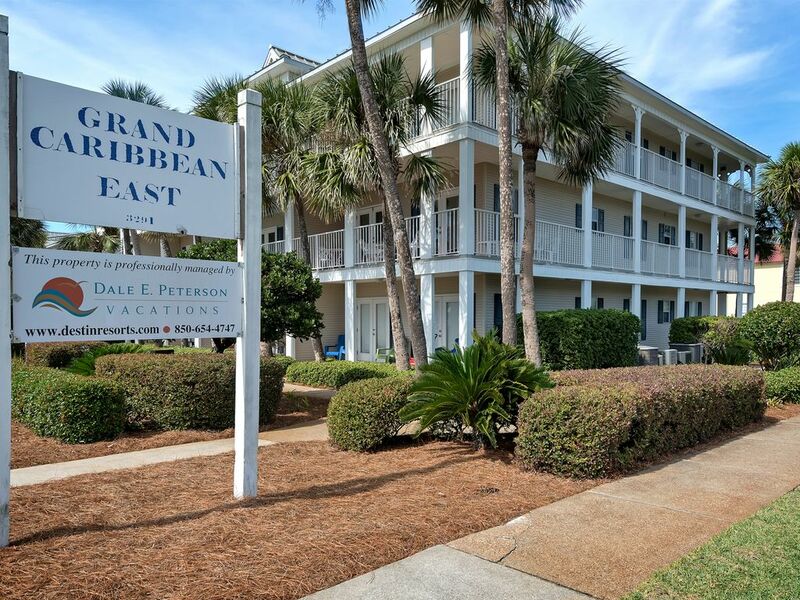 Grand Caribbean East in Destin, FL (Crystal Beach area). One bedroom, one bath condo. This unit has a queen-size master with flat screen TV, hall twin size bunks beds, sofa sleeper & flat screen in living room. It can accommodate up to 6 comfortable. Ideal for a couple or small family. Condo and property is WiFi friendly. This unit is located on the 2nd floor in a three story complex. It offers all you need for a great week on the beach. Washer & dryer in unit. Full kitchen with all appliances. All the amenities of home. Upgraded and re-decorated. New carpet, décor, TV's & accessories. Direct beach access to the Gulf of Mexico. Sugar-white beaches, pool, hot tub, completely furnished with TVs, DVD/VCR, telephone, WiFi, large private balcony, second floor unit in a three story complex with GREAT Gulf views. to offer. Come Enjoy Our ' Tropical' Vacation Paradise! We hope you will be vacationing with us soon. The resort is less than 4 miles from Indian Bayou Golf Club. Grand Caribbean Destin guests will enjoy an outdoor heated pool and a hot tub. Grand Caribbean Destin offers guests beach access and video rentals. On-site laundry facilities are available for added convenience. Guests will be 1 mile from Silver Sands Factory Stores and 4 miles from Big Kahuna Water and Adventure Park. Henderson Beach State Park is only 3 miles away. Parents can watch children swimming from the condo's balcony. We love pet but the HOA does not allow renter's pets. You can watch your children playing while you hang out in the balcony. Most comfortable beds ever!! Convenient to beach and restaurants. Would definitely recommend staying here to friends. This place is amazing. It is located directly across the street from the beautiful beach. It has a heated pool and large hot tub. The condo itself is beautifully decorated, clean - looks just like the photos. The condo is extremely roomy and the kitchen is the perfect size for cooking. The community is super friendly. We will definitely be back. There is so much to do and see in Destin and this condo is centrally located to everything. Thanks so much for a fantastic family vacation. We enjoyed our week in Destin, Fl. The condo was very close to the beach with a beach view. We appreciated the in unit washer and dryer. The condo was clean but was a little worn. The couch didn’t have much support and the sheets were worn. Over all it was a nice condo at a good value. Nice place to stay, great location and view of the ocean. Property was just a in the pictures. It is located just across the street from the beach, easy walk. Condo has a great view of the pool, and glimpse view of the Gulf on each side. Property was clean. Bed was comfy. This was our second stay at this condo and will definitely be back again soon! The space is just right for out family and had everything we need! The view is awesome and convenient to every thing! The owners are always a phone call away and there when if we needed anything! Thanks again for allowing us to stay in your beautiful condo!